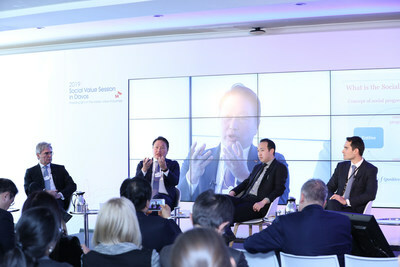 DAVOS, Switzerland, Jan. 25, 2019 /PRNewswire/ -- Chey Tae-won, Chairman of SK Group, the third largest conglomerate in South Korea by asset size, today presented 'social value' as a methodology for sustainable growth, while attending the World Economic Forum 2019 held in Davos, Switzerland. In the age of 'globalization 4.0', this innovative methodology suggests that global issues can be solved by creating social value through new business models as opposed to zero-sum games and competition. During the 2019 Annual Meeting at Davos, SK Group hosted a private session titled "Shedding light on the hidden value of business" in partnership with Boston Consulting Group (BCG). The session brought together prominent social value experts from the worlds of business, academia and the investment community, including Joe Kaeser, CEO of Siemens, Hans-Paul Bürkner, Chairman of BCG, George Serafeim, Professor at Harvard Business School, and Kevin Lu, Partner and Chairman of Asia at Partners Group. Panelists discussed their experience in creating social value and the major obstacles in bringing impact investment to the mainstream. In today's business environment where 'connectivity' driven by digital technology forges relationships between corporations and society, corporations are expected to play a bigger role as social citizens in addition to their role as economic value creators. As such, SK Group has implemented transformative corporate objectives to create social value. It is a proactive vision that utilizes corporate resources and capabilities to solve social issues and problems. As a panelist, Chey Tae-won, who has led the SK Group since 1998, shared his vision and provided an update on the progress the company has made in generating social value. Engaging with the other panelists and the audience, he made a strong case for a 'deep change' to make businesses sustainable and presented social value as the cornerstone of this new strategy. As an example of an innovative approach to generate social and economic value simultaneously, Mr. Chey introduced a new accounting methodology, the 'Double Bottom Line' (DBL). This methodology is currently being implemented across the SK Group, and it incorporates a host of indicators pertaining to the environment and social well-being. It is based on Chey's belief that economic value and social value are mutually re-enforcing. SK Group plans to report all its 17 affiliates' contribution to social value alongside net income on its income statement. Receiving a wide range of public support and interests, SK Group has also signed 8 MoUs on DBL with state-owned companies in South Korea. SK Group has pioneered the approach by increasing its efforts to build a new measurement methodology that is flexible and can be applied to a variety of contexts, projects and stakeholders. The comprehensive pilot scheme developed by SK Group called 'Social Progress Credit' (SPC) is grounded on collaboration and consensus and seeks to reward social enterprises cash incentives for their social outputs. "SK Group is running an experimental pilot scheme that measures social value and provides incentives in proportion to social value generated. The objective is to support the growth of social enterprises," said Mr. Chey. "Interestingly, the financials of many enterprises also improved. The number of participating entities where operating profit returned to positive territory rose by 30%. The employment of the disabled and the elderly also increased." Experts who participated in the session shared the need for creating social value as a means to drive sustainable business. In particular, they discussed how social value can be measured and incentivized, and how pursuing social value can be made mainstream for companies. During the opening remarks, Hans-Paul Bürkner, Chairman of BCG said, "BCG has been helping our clients expand the positive societal impacts that they create through their products, services and how they operate as a business". George Serafeim, Professor at Harvard Business School who leads the Impact Weighted Accounts Initiative (IWAI) added, "In the transition to impact economy, it is critical to accelerate the practice of considering social and environmental factors alongside financial performance in corporate management and investment decision-making". Some of SK's recent initiatives aim at maximizing the social value of its tangible and intangible assets through new collaborative frameworks. For example, SK Group launched the shared infrastructure initiative, where the firm opened its domestic network of SK gas stations to external stakeholders. This initiative received more than a thousand proposals for shared-space utilization and SK's competitors have also joined the initiative and contributed facilities of their own. Mr. Chey said, "We live in a shared economy, and must challenge our traditional way of thinking. If we adopt the view that our assets, as an infrastructure, can be shared with our consumers, stakeholders and wider society, we can develop new business models and create more social value". SK Group (www.sk.com/en) is the third-largest conglomerate in Korea by asset size. It was founded in 1953 and has 101 subsidiary companies in energy∙chemicals, ICT, semiconductor, and biopharmaceutical sectors. SK Group has 16 companies listed on the Korea Exchange (KOSPI and KOSDAQ), including SK Holdings, SK Innovation, SK Telecom, SK Hynix, and SK Chemical. The Group has two subsidiaries in 2018 Fortune 500 list - SK Holdings (95) and SK Hynix (442). Chey Tae-won has increased SK Group's assets to US$121.7 billion in 2017, a 500% increase since he came to office as Chairman in 1998. In 2017, SK Group participated in the consortium led by Bain Capital acquiring a significant stake in Toshiba's memory chip business. In July 2018, the group also acquired a 100% stake in a US-based biopharmaceutical company AMPAC Fine Chemicals and announced the investment of US$1.67 billion in November to build a new electric vehicle (EV) battery manufacturing facility in Georgia, USA.